About hygroscopic properties of the Himalayan salt lamp's absorb moisture from the air. Lamp should not be used in damp rooms or outdoors. However, if the lamps should get wet, Just remove the electric fitting and clean with any sponge or tea towel. Once clean the lamp then put it for dry or if you wish to quick dry just use hair blower, once dry then just use it as you use normally so that the warmth of the light keep dries it. If you live in exceptionally humid or wet weather conditions, it is strongly recommended that you have the lamp on continuously to keep it as dry as possible. 100% Pure and best quality Natural Himalayan Salt Lamp. Manufacturer and import direct from foothills of Himalayans. Our workers get best quality crystals for our UK based customers. So Purchase from Mineral Salt if you wants to get top quality salt lamp. Our Natural Salt Lamps Craft by our Professional and Experienced workers, which gives attractive looks as well as uncountable benefits. When we switched on with bulb heat lamp heated up & the negative salt ions released by heating can boost blood flow, improve sleep, increase levels of serotonin in the brain, and calm allergy or asthma symptoms. These negative ions are said to neutralize electromagnetic radiation from household electronics, and even prevent the build-up of static electricity. Just love these lamps. Thank you for sharing this very good deal. 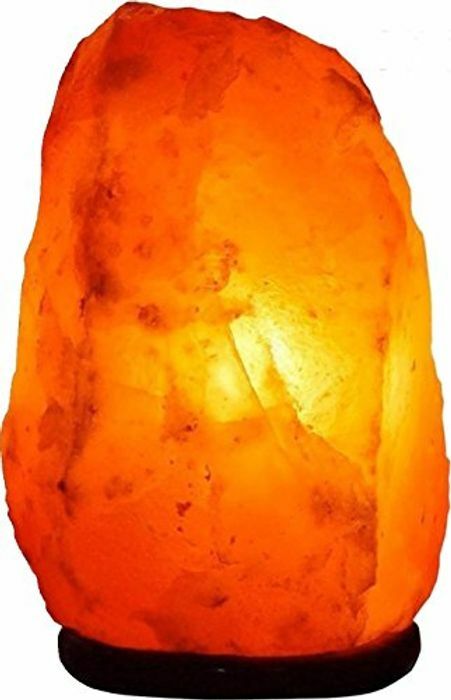 Good price for this Crystal Rock Salt Lamp, almost 30.00 near where I live. I have one of these and love it. Makes the room look so nice in the evenings.